Many of our projects require us to do large amounts of lip sync. People here at Sun & Moon are known to get into a meditative zen like state as they listen and animate, listen and animate, listen and animate to audio that they’ll be dreaming about for weeks to come. Here are the key shapes we use in our lip sync. We label them with single letters but each shape can be used for multiple sounds. “M” for example is also used for “b” and “p”. We’ve also had a few projects which have required Welsh lip sync. This isn’t actually as hard as it sounds. In fact in many ways it is easier! You become solely focused on how the word sounds rather than over complicating things by being familiar with the spelling. Take the word “animation” for example. If you are considering the spelling of the word you could be tempted to use the following shapes: a-s-e-m-A-s-A-s. This is way too many shapes and creates an overly choppy or robotic effect to the lip sync. 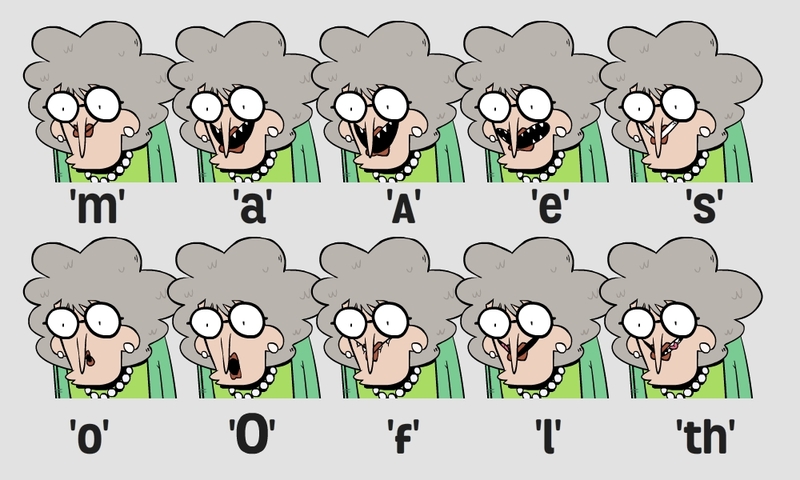 When you focus on the key sounds of the word you can strip the word down to just using five mouth shapes: A-e-m-A-s. 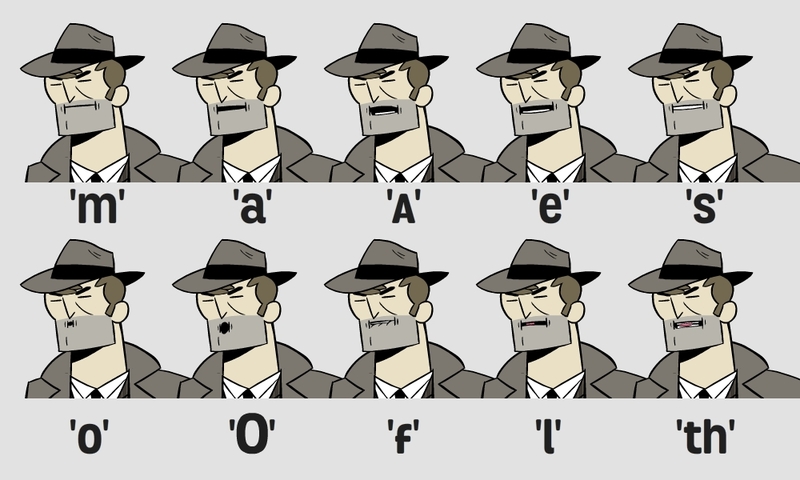 This is a much more manageable amount of key frames for the time it takes to say the word and it will result in a much more naturalistic effect. When we talk we don’t make all the individual shapes in a word with our mouth. It’s far too much effort! Our mouths are lazy and take the shortest route possible to say the word. Yup it’s easy when you know how. Lip sync can be a great opportunity for humour. Below are the mouth shapes for “Maths Mutt”, the genius talking dog that helps his owner solve maths problems in a series we created for BBC Bitesize. Maths Mutt is a bit of a loud mouth, know-it-all and this is reflected in his mouth shapes for lip sync. There is a pretty extreme contrast in the various shapes which makes for an exaggerated movement when he talks, bringing his absurd nature front and centre in his characterisation.